Football players are among some of the finest athletes in the world and that’s a testament to their grueling regime. If you want to perform at YOUR best – whatever level that might be – you can learn a lot from the way the Pros train. First and foremost, a football training program has to meet your own specific needs. Any effective training regime should be built on the back of a solid fitness assessment and baseline testing. Sport specific fitness tests allow athletes and professional trainers to identify physical strengths and weaknesses. They act as a benchmark upon which a complete training program can be developed. A benchmark can be set for each component of fitness. Seeing definite results in black and white is usually more inspiring and motivates an athlete to continue to strive for higher goals and progress. The foundation of any effective football conditioning program is strength training. Absolute or maximal strength in and of itself is not enough though – not if football players want to reach their full potential. To gain the greatest advantage, gains in maximal strength should be converted into explosive power. Power is a combination of strength and speed. And in football, with all other factors equal, the player with the greater power will come out on top. A complete football training program lasts 12 months – even if the competitive in-season only spans from September to December. 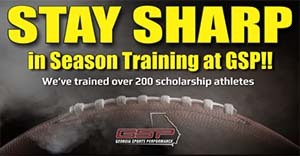 GSP is a quality program that adjusts training to fit the needs of the athlete throughout the post season, pre-season, and in-season.